Opposition lawmaker Nikol Pashinyan on Monday announced his plans to initiate President Serzh Sargsyan’s impeachment through parliament. He also called on the three leading non-governing forces to back the process that he said would prove their stated commitment to “regime change”. 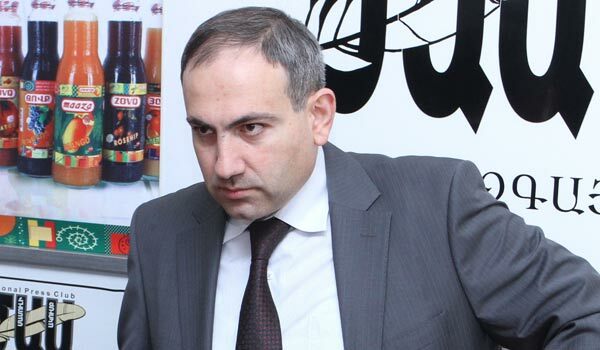 Pashinyan told RFE/RL’s Armenian Service that he will formally present the Armenian National Congress (ANC), Prosperous Armenia (PAP) and Heritage parties with a motion to call an emergency parliament session that would debate impeachment proceedings against Sargsyan. He said the three minority factions are capable of securing 44 signatures in the 131-member National Assembly. “With this political initiative I am trying to welcome the idea of a totally different Armenia and make my contribution to the fulfillment of the trio’s pledge to end the ‘heated political autumn’ with regime change,” Pashinyan said. Representatives of the Troika parties did not immediately react to the idea voiced by the opposition lawmaker.